St. Patrick’s Day is the perfect excuse to party in the middle of March. Whether you’re Irish or not, many Sydneysiders get their green on for a fun day out and celebrate St Patrick’s Day in in one of the many Irish bars across Sydney. From nonalcoholic drinks like smoothies and mojito mocktails to boozy beverages like margaritas and more, there’s a showstopping lineup of delicious green drinks now on sale for St. Patrick’s Day. However Ireland is more famous for its Guinness and legend has it that over 13 million glasses of Guinness are consumed around the world on St Patrick’s Day. 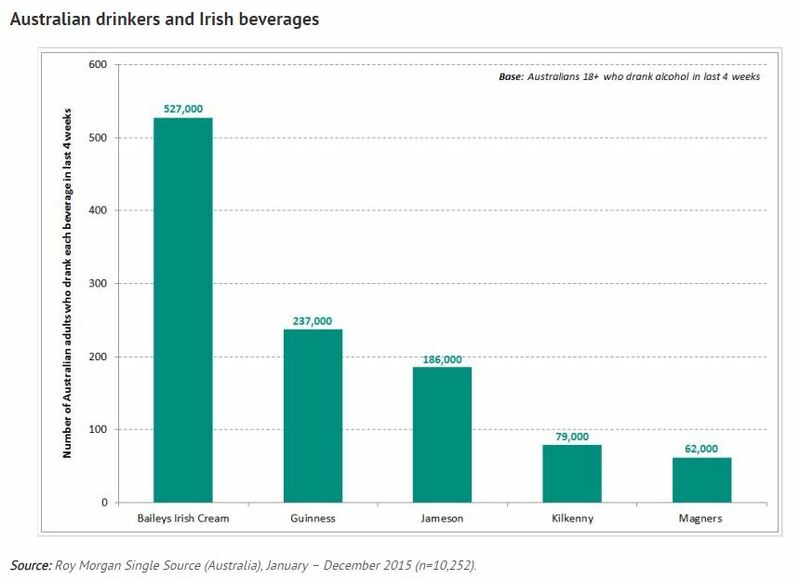 But according to the latest findings from Roy Morgan Research, the Irish beverage that’s top of the drops among Australian adults is not the pint of the black-stuff but Bailey’s Irish Cream. In 2015, 527,000 Australians 18+ drank Baileys Irish Cream at least once in an average four weeks, putting it well ahead of Guinness (237,000 people) and the country’s world-famous whiskey, Jameson (186,000 people). Baileys is especially popular in Western Australia where nearly one in every 20 alcohol drinkers (4.9%) consumes it at least once in an average four weeks, a fraction ahead of New South Wales (4.5%). Tasmania has the country’s lowest Baileys consumption incidence (2.6%). While Guinness, Kilkenny, Jameson and even Magners cider are more popular among men than women, the opposite is true for Baileys Irish Cream. Women are far more likely than men to drink Baileys, with 5.2% consuming it at least once in an average four weeks, compared with 3.2% of men. “While St Patrick’s Day is traditionally associated with drinking Guinness, our data tells us that the black stuff comes a distant second to Bailey’s Irish Cream as Australia’s most popular Irish alcoholic beverage. In fact, while the number of Aussie adults who consume Guinness has declined by about 60,000 people per four-week period over the last decade, Bailey’s has gained an additional 90,000 drinkers per four weeks. “Bailey’s popularity is due particularly to women drinking it, peaking among the 18-24 age bracket (7.3% of whom drink it in an average four weeks). But whereas there has been little change in consumption incidence among this group in the past 10 years, Bailey’s has made incremental inroads with the 50-plus bracket (both men and women). Is Bottled Water Australia’s New Favourite Drink?